Artificial Intelligence, better known as AI, has taken giant strides in the last few years. It has now become an integral part of daily lives and handles complex functions. AI is an area of computer science with a focus on the development of machines that think and work like humans. Also, Artificial intelligence enables a computer program or robot to feel like a human and respond. There are three aspects associated with AI consulting, i.e. learning, reasoning, and self-correction. With extreme potential exhibited by AI, it has found application in a large number of area. As per a recent report by Gartner, by 2020 more than 85% of customer interactions would be managed without humans. Most popular applications of AI have been in chatbot development, medicine, robotics, legal, and finance sectors. Due to the many advantages, many companies have started investing in this technology. They are availing services of Artificial intelligence companies in India. Thereby ensuring innovative applications of this technology. According to Adobe, more than 46% of business enterprises will put in place AI in their operations by 2019. The main reason behind wide acceptability of AI is the savings on time and cost. It can replace humans from various routine tasks. This frees up the crucial human resources to focus on other essential tasks. AI consulting services help with the integration of AI in daily business operations, smoothly. When AI was still in the early stages, there were many apprehensions related to it. Some of the backtrackers said that it would act as a disruptor. Others used to fear that it would replace humans. All these fears do not have any merit. Artificial intelligence is being embraced by all types of businesses big corporates to medium-sized business. It has emerged as a product and business enabler rather than a disruptor. According to a recent survey, is more than 80% of executives believe that AI helps improve worker performance and creates jobs. To understand the “enabler” avatar of AI, it would be pertinent to mention the views of Cynthia Stoddard. Cynthia Stoddard is the senior VP and CIO at Adobe. She has spent more than twenty-five years in tech management. She has experience of working across a range of hi-tech companies. At Adobe, she is currently working on many projects. The most prominent projects being cloud services and building self-healing platforms based on robotics and AI. According to Cynthia, Artificial intelligence is a crucial area for Adobe. The company is running training programs to ensure that all people in the organization have an AI mindset. It would enable them to incorporate AI into product and business operations. At Adobe, the primary application of AI has been in IT, to create self-healing platforms. Acting as an enabler, AI identifies the patterns if any issues come up in IT operations and cloud based CRM services. It then works out solutions that are free from human prejudice. This frees up human resources to work with algorithms and other important tasks. She further adds that the company is trying to use AI to run some business operations. The initial foray would be in the finance department. They are trying to identify repetitive tasks where they can place AI-powered robots. She further explains that the level of efficiency in the functions is enhancing manifolds with AI. The self-healing framework fixes the problems itself and does not allow the user to experience any problem. The self-healing framework has built-in metrics to help understand how many problems it heals. It is then compared with a knowledge base to know how long it might have taken in the past to correct the problem. 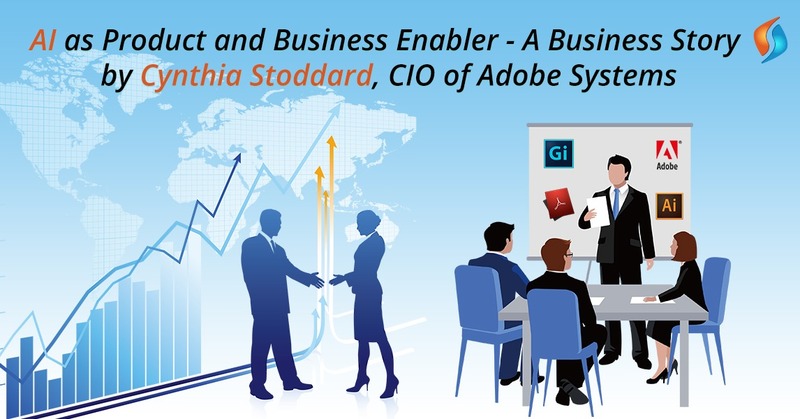 Cynthia further said that she believes that special skills are desirable before Adobe starts to roll out AI-based solutions. These skills are innovation, creativity, knowledge of AI algorithms and methods. One other skill that is important is the ability to work in the open source market. As many open source resources contribute to creating these self-healing frameworks. Views from Cynthia help one understand the importance of AI. Instead of being a disruptor, Artificial intelligence can be a business and product enabler. Not only does it help with cost savings, but it also takes out the element of human prejudice. It makes sure to offer an instant response to a particular problem. Thereby stopping any such error from affecting the work. To harness the advantages of AI, companies need to invest in their human resource. Employees need training in AI and usage of open source resources. The possibilities with AI are limitless. Availing services of AI development companies are desirable as it ensures seamless implementation of AI in business operations. As per Adobe, more than 47% of digital organizations have a well-defined AI strategy in place. Business operations are becoming complex, and quality human resources are becoming scarce. It has become essential for businesses to invest in AI. It helps with their business operations. Machine learning companies in India ensure smooth implementation of AI across business operations. Hence, delay in taking the decision can result in lagging behind the competition. If you are also looking for quality AI and machine learning consulting for your business, your search ends with Signity. We have many years of experience in handling complex tasks for our clients from across the world. Hire our outsourcing team of AI experts who will ensure seamless integration of AI with your business operations. We work round the clock to develop high-quality AI solutions for your business. Get in touch with us today and avail our AI development and implementation services. Contact us now.